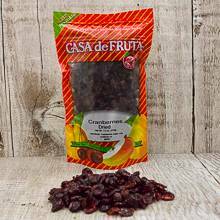 These dried cranberries are great for snacking, wonderful for cooking and are especially good in muffins and breads since they are sweetened with sugar. Their tart flavor and chewy texture make this a sweet treat, and add flavor to oatmeal, cereal, yogurt, sauces, and salads as well. Packaged in a 7.5 oz. bag.